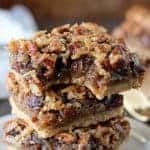 Chocolate Pecan Pie Bars – A brown sugar shortbread crust topped with a gooey maple filling loaded with pecans, shredded coconut, and chocolate chips. Flavor and texture in every sweet and sticky bite! Recipe VIDEO below! I wish you could come over to my house right now. 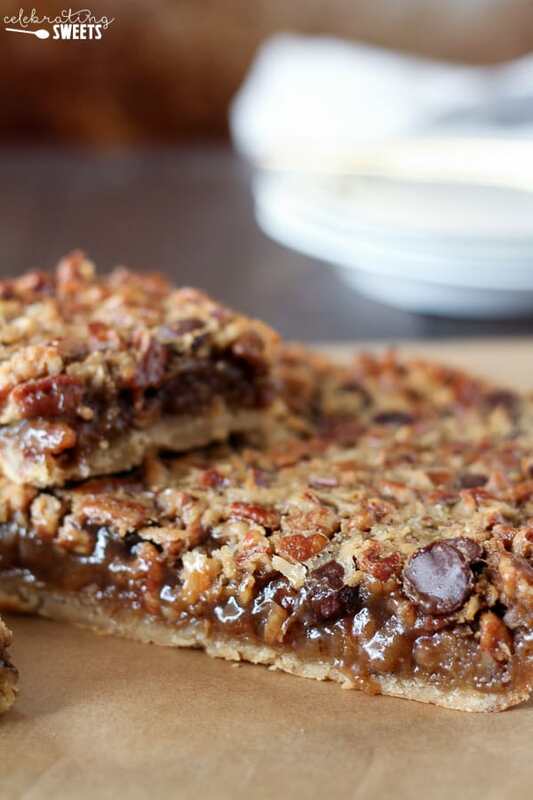 We’d sit on the couch with a cup of coffee in one hand and a Chocolate Pecan Pie Bar in the other. Our laps will be covered in buttery crumbs and we’ll be discussing the important things in life. Also, we’ll agree that I won’t count the calories if you don’t. Deal? This here is the most delicious way to get your pecan pie fix. 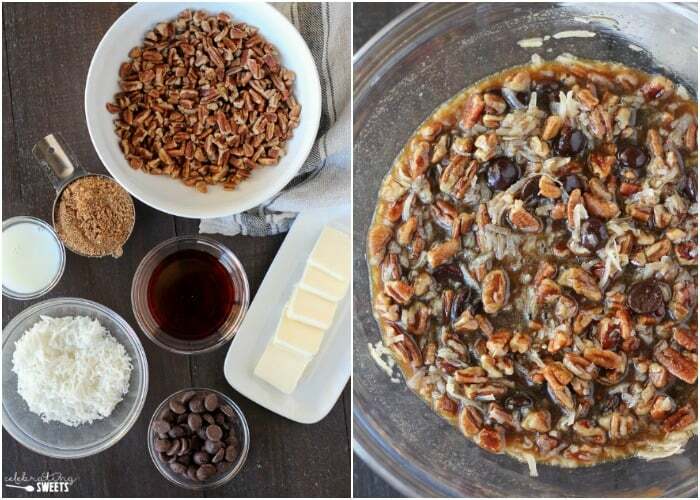 Imagine the best pecan pie you’ve ever tasted, then add chocolate chips and shredded coconut. Kind of like the topping to German Chocolate Cake. These ingredients were made to be together! Pecan pie elevated to level AMAZING. Crunchy, gooey and sweet perfection. Yep, you read that right I managed to make a recipe resembling pecan pie without corn syrup! 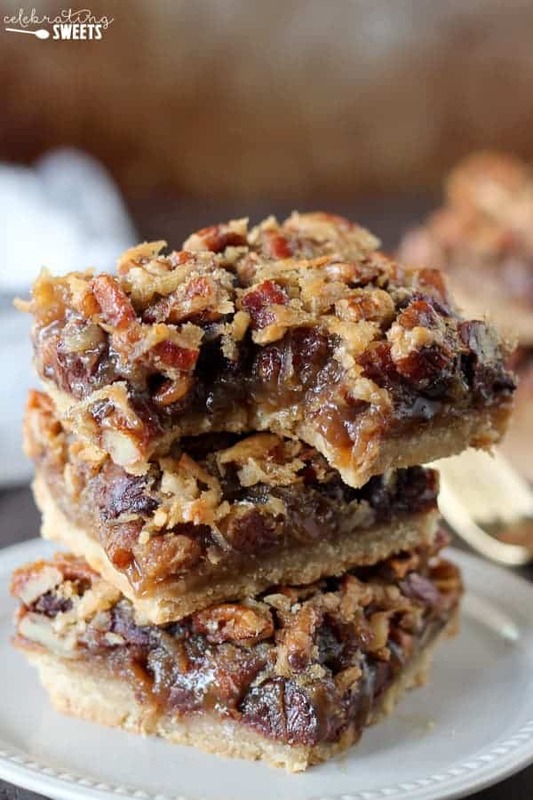 These bars gets their sticky sweetness from a combo of brown sugar and pure maple syrup, which add so much flavor. 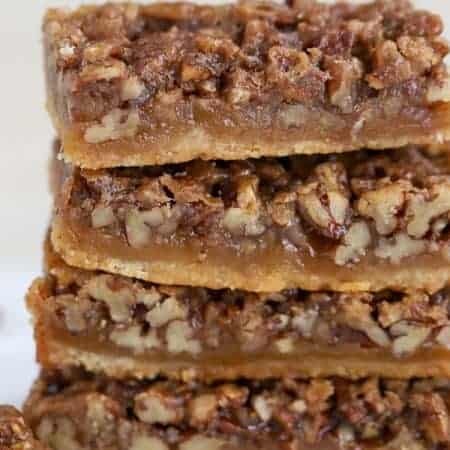 In my opinion (pecan pie purists should stop reading now), these bars are way better than traditional pecan pie. There’s no crust to roll out, and the base is a quick shortbread crust which is pressed into and 8×8 pan. 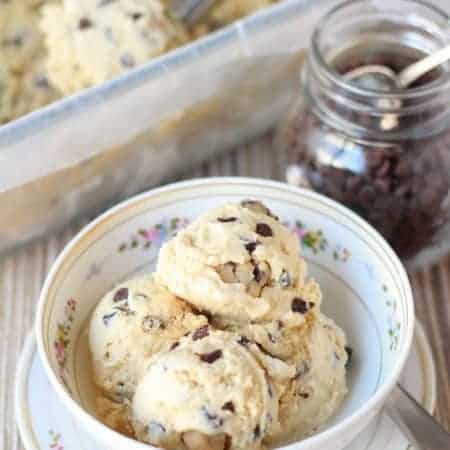 The crust is filled with chocolate chips, shredded coconut, and chopped pecans, which are all suspended in a thick brown sugar and maple syrup mixture. Phenomenal flavor and texture in every bite! I’ll be making these for Thanksgiving, and approximately one million more times between now and then. Promise me you’ll do the same. 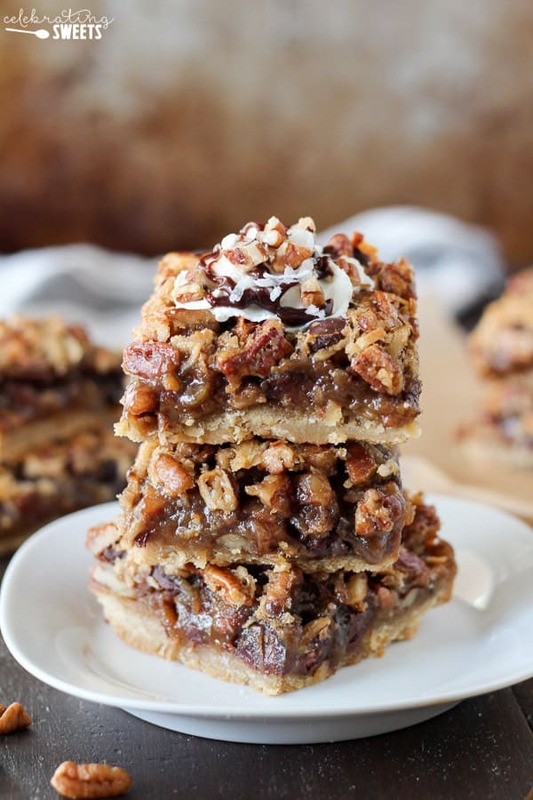 A brown sugar shortbread crust topped with a gooey maple filling loaded with pecans, shredded coconut, and chocolate chips. Flavor and texture in every sweet and sticky bite! Preheat oven to 350°F. Line an 8x8 pan with foil, leaving a couple inches overhang. Spray or butter the foil. Using a hand mixer or stand mixer, beat butter and brown sugar until creamy and combined. Add flour and salt, beat until thoroughly combined. Dump the mixture (it will be crumbly) into the prepared pan and press it evenly into the bottom of the pan. Bake for 15 minutes. Meanwhile, prepare the filling. In a large bowl, combine melted butter, brown sugar, maple syrup, milk, and egg. Whisk until combined. Add pecans, chocolate chips, and coconut and stir until combined. Pour the filling over the crust and gently spread it around with a rubber spatula so that the solids and liquid are evenly distributed. Return to the oven and cook for about 23-25 minutes. The mixture should be bubbling slightly around the corners. The edges will be set but the center will still be a little jiggly. It will firm up as it cools. Place pan on a wire rack to cool completely before cutting into squares. Sprinkle lightly with sea salt, if desired, to add a contrast to the sweetness. 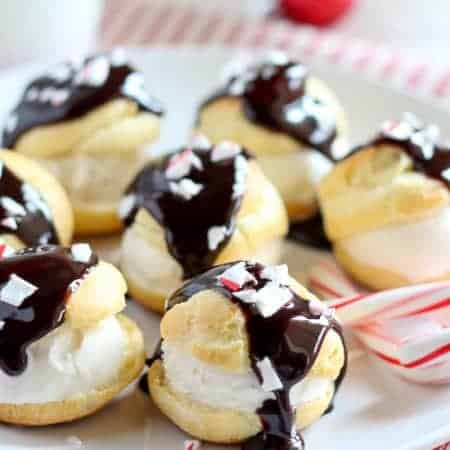 You can top these with whipped cream or ice cream, if desired. I need to print this recipe and make it for my mom. She will love this! Pecan pie is no joke one of my favorite desserts, especially this time of year. So making them in little bars – amazing! Chocolate, coconut and pecans all in one bar? I think I just died and went to dessert heaven! STOP! That was my reaction when seeing this recipe and the German chocolat brownies and the coconut brownies and the pumpkin pie praline bars… Sunday marked one year of making your recipe for the carrot/pumpkin/pineapple/coconut cake with cream cheese frosting. It is still the BEST recipe and requested often. I wrote that could be the only recipe I need. Now I must try all these. I would love to have that coffee with you and not count the calories or the sugar content. Thanks for the recipes. Is it ok to double or triple this recipe? Sure! Just make sure you use a large enough pan. Enjoy!